Typically Mother Nature decides when we get to see a rainbow. 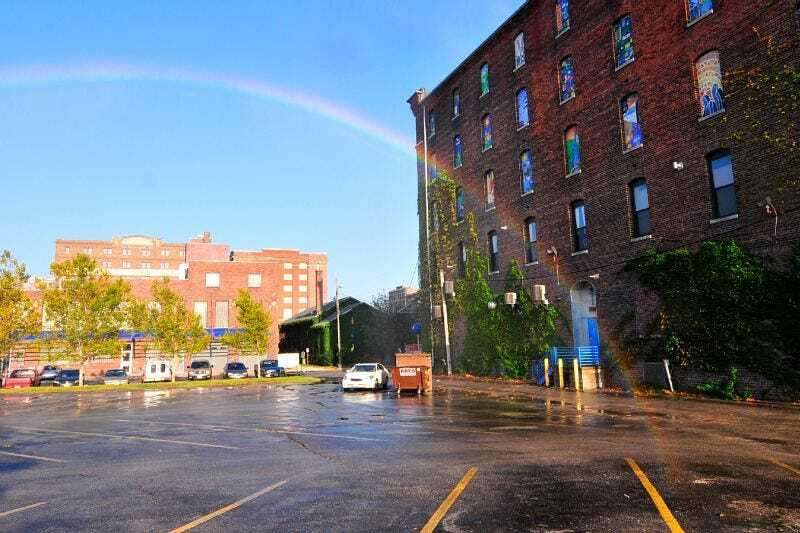 College professor and artist Michael Jones McKean isn't exactly the patient type, so he made a machine that generates two-story rainbows with the flip of a switch. McKean, a professor at Virginia Commonwealth University, has been conducting experiments on rainbows since 2002. He's finally seeing the fruits of that labor in the form of some serious man-made rainbows. Like ones that span entire buildings. You'd think that after 8 years of rainbow research you'd be bouncing rainbows off the moon or something, but hey, I'm not scientist. His rainbow machine is comprised of commercial jet pumps and custom-designed nozzles that spray a dense wall of water into the sky—it's the same as how you can get a rainbow from the sprinkler in your backyard, just on a much more impressive scale.